It all begins with a port. Now this isn't just any port, but Port Arthur on the Kwantung peninsula. A strange name for a Chinese port; its actual name started as Lushun. It was named Port Arthur because of a British lieutenant in the Royal Navy. The Japanese and Chinese fought the first Sino-Japanese war in 1895. At that time, the Japanese had seized the harbor without too much trouble and proceeded to make themselves at home. The Japanese had not figured on the Western powers and their view of the Asian situation. The Western powers banded together to force Japan to give up their spoil of war, Port Arthur. Then, to the Japanese loss of face, the Russians moved into Port Arthur a few years later. Port Arthur became the dirty gem of the Russian eastern empire. It was exactly what they needed, a fine port and also a warm water port on the Pacific Ocean. Vladivostok, hundreds of miles north, was ice bound three months of every year. So now the stage is set for the clash between the huge Russian bear and the rising sun. Those who look to Taranto in 1940 for the blueprint of Pearl Harbor in 1941 are slightly mistaken. The technical difficulties of using plane dropped torpedoes in shallow water were solved by the British in 1940, but the plan to attack another country's fleet without a declaration of war was forged in 1904 and Port Arthur. The Russo-Japanese war brings some interesting characters into its shadow, Teddy Roosevelt to name one. Commander Fuchida Mitsuo, when flying over Pearl Harbor in 1941 said "had these Americans never heard of Port Arthur?" The battle that is most remembered about this war is the naval battle of Tsushima. After the Russian naval forces in the Pacific were neutralized, the Russian Tsar sent the 'Second Pacific Squadron' from the Baltic all the way to the Sea of Japan. The amazing journey reads like an extremely long funeral march. 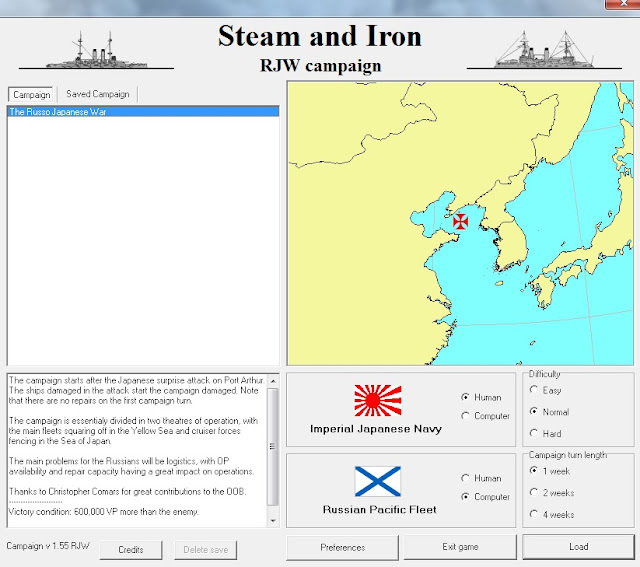 Naval Warfare Simulations, who brought us Steam and Iron, and then its campaign expansion, are now responsible for bringing to life on the computer the Naval war portion of the Russo-Japanese war 1904-1905. The game starts with the sneak attack on Port Arthur already having taken place. 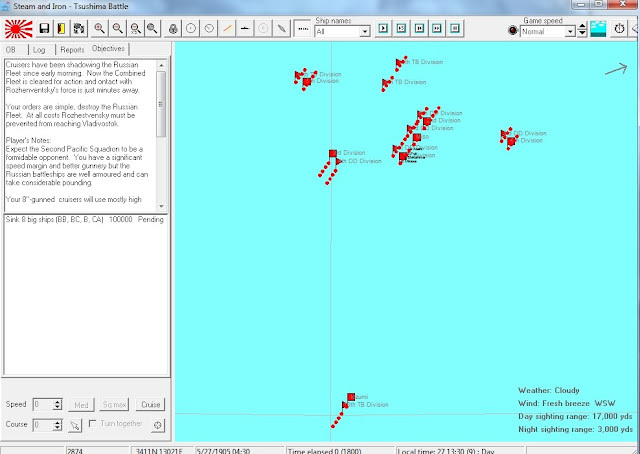 The historical losses of the Russian fleet are already tallied. So it is up to you as Togo to command the Japanese Navy and to destroy the Russian fleet in Port Arthur before Russian reinforcements can make their presence felt. 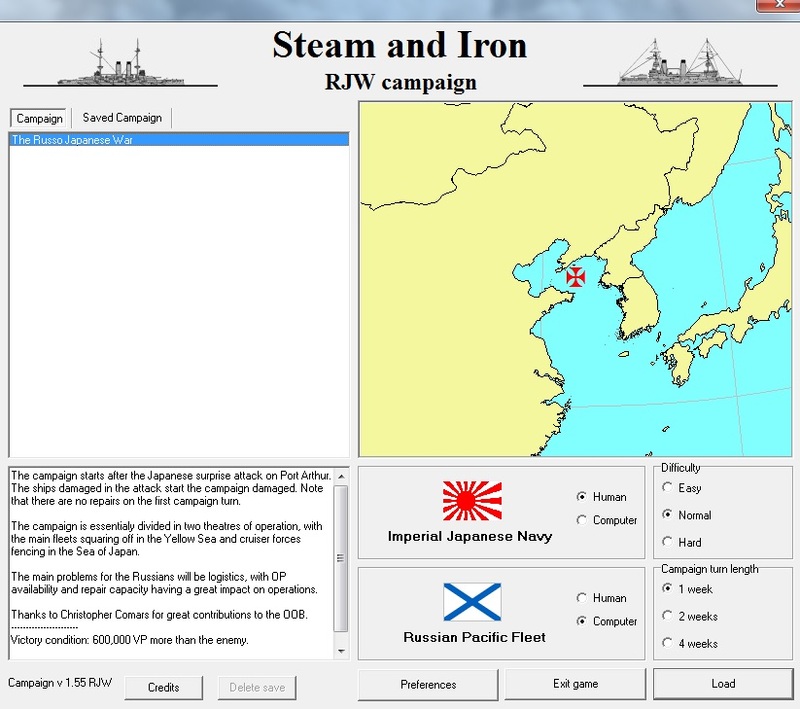 As the Russian naval commander, you must try to damage the Japanese fleet as much as possible and stop the Japanese army from being supplied from its home bases. This is a test bed for WWI. Torpedoes, mines, and battleships are used for the first time in large numbers. This is the second part of Naval Warfare Simulations trilogy of the naval wars in the early twentieth century. The first was 'Steam And Iron', then 'SAI Russo-Japanese War', followed by their opus 'Ruling The Waves'. SAI RJW is a stand alone program. You do not need to have the original Steam And Iron to play. It has included within it a campaign game of the Russo-Japanese naval war and much more. You can also fight any of the six historical scenarios from the war. There is a seventh 'Beresford's Boast'. When the Russian Second Pacific Squadron was going through the North Sea at night, they ran into a small flotilla of British fishing trawlers. Assuming them to be Japanese torpedo boats, they attacked the boats and caused some casualties. Britain and Russia almost went to war over it. British admiral Beresford boasted to the British government that he would attack the Russian fleet using only half his battleships to make it sporting. 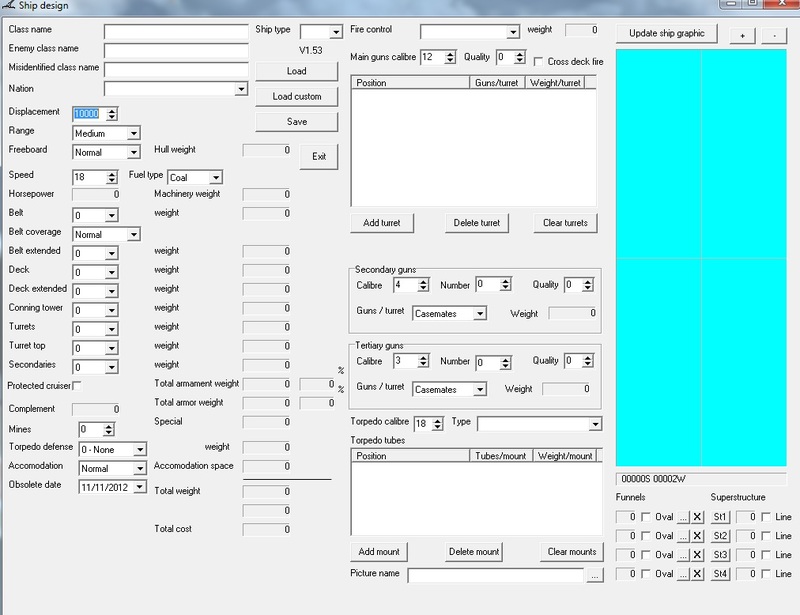 With this purchase you will also get a scenario and ship editor. This will allow you to fight naval battles from this time period anywhere in the world. Included are the naval forces for the following countries: Russia, Japan, Germany, Britain, Italy, Austria-Hungary, Spain, US, and France. You have a choice to command in several different layers: Admiral's mode with its command and control limitations, to Captain's mode where you can micromanage to your hearts content. 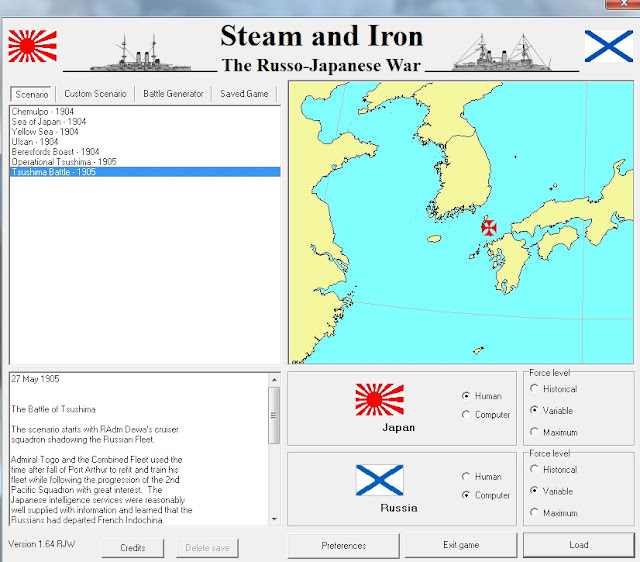 A well done game about the entire Russo-Japanese war is on my bucket list. For now I will have to play this for my naval fix, and Age of Rifles for my land. There is a book called 'The Tide at Sunrise' by Denis and Peggy Warner that in my opinion is the best and most complete on the whole war. It seems like I re-read it almost every year.